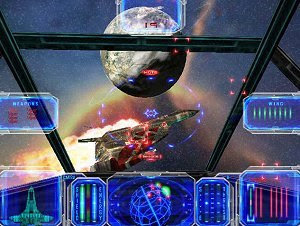 Star Wraith 3 took the graphics and gameplay to an entirely new level. This was the first game to feature multiplayer, players of the game could connect to each other over the internet or a LAN and test their skills with real people. The cockpit was revised to present a more enclosed structure with better textures. Players could also descend into planets to attack targets on the surface and a new asteroid cave environment was added to provide a 'hide-n-seek' arena for multiplayer battles. The campaign in this game was dynamic and player directed (developing based on both their mission choices and their performance). The 3D spherical radar was enhanced in this game with an orientation globe and directional blips instead of boxes.